How far I fled I do not know. Behind me I heard the howls of' the villagers, and their stumbling and blundering pursuit. Then only the yells, and those distant and far away, and then even they faded out. For few of my brave villagers had stomach to follow me into the deep woods, where the shadows were already stealing. I ran until my breath was jerked out of me in racking gasps, and my knees buckled, hurling me headlong in the soft leaf-carpeted loam, where I lay in a half-faint, until the moon climbed up, sheathing the higher branches in frosty silver, and cutting out the shadows yet more blackly. About me--I heard rustlings and movements that betokened beasts, and perchance worse-werewolves and goblins and vampires, for all I knew. Yet I was not afraid. I am nothing short of madly in love with this picture. I want to smother it in kisses and take it to the movies and argue about my dinosaurs taking over the living room. I love it so much. 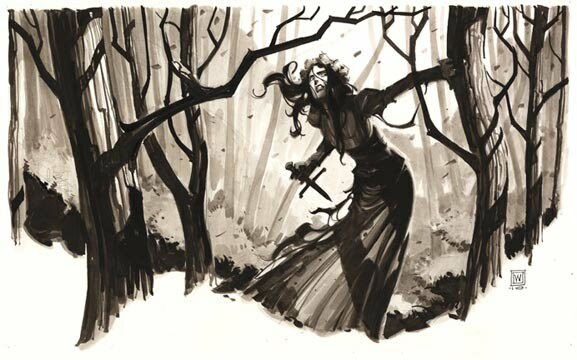 This is Dark Agnes, as a bride, running through the forest with a dagger, after slaying her boorish fiance. It's one of the most iconic moments in any story Howard ever wrote. If I didn't know what would probably happen to me if I even attempted it, I would marry this picture. What's even more amazing is Watkiss' original illustration for the cover - which was rejected by Del Rey - is even better. It combines Agnes' femininity with a sombre sense of place, as if it captures the instant when Agnes chose the path of the sword, as she's alone in the woods. It is simultaneously gentle and powerful, masculine and feminine, optimistic and fatalistic. Watkiss, I think I might be going gay for you. 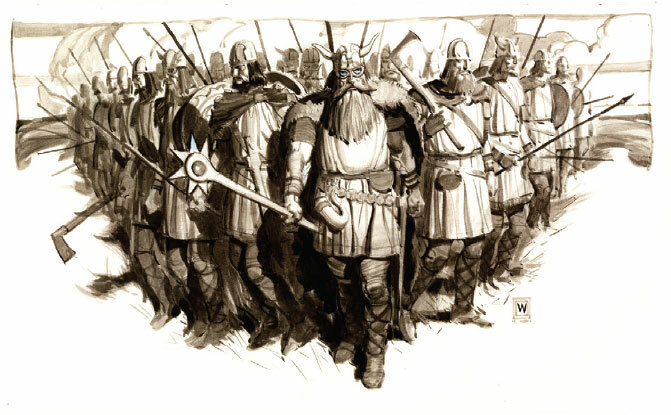 At the tip of the wedge, like the point of a spear, were the champions of Lochlann – Broder in his dully glittering blue mail which no blade had ever dinted; Jarl Sigurd, tall, blond-bearded, gleaming in his golden-scaled hauberk; Hrafn the Red, in whose soul lurked a mocking devil that moved him to gargantuan laughter, even in the madness of battle; the comrades Thorstein and Asmund, tall, fierce chiefs; Prince Amlaff, roving son of the king of Norway; Platt of Danemark; Jarl Thorwald Raven of the Hebrides; Anrad the berserk. Hell yes. All the ferocity of the implacable Danish horde, ready to take on Brian Boru's band in the battle to decide the fate of Ireland, and a microcosm of the battles between Ancient Evil and Man's Own Destiny. It's another winner. So far, Watkiss is utterly kicking my arse. I wish I could have every single picture to put on my wall. They're that awesome. He'd almost won me over. However, I do have one major problem: his depiction of Cormac Fitzgeoffrey. And here's John's illustration for, I presume, the aftermath of the final confrontation between Cormac and Nurredin. Why is Cormac so damn skinny? Facially, he looks great. But physically... no. There is nothing in that illustration that suggests anything "gigantic," "big," "huge" or "bulky." Cormac Fitzgeoffrey was clearly a huge dude. This guy I'd describe using words like "lithe," rangy," "compact," "panther like." Most jarringly, he looks so skinny that he actually looks taller than six foot. He looks almost like a black-haired version of Michael Whelan's Elric of Melnibone. What's frustrating is those Danes in the first picture have the exact sort of physique I imagined! I brought this up to Jim & Ruth Keegan at Howard Days, and their explanation is fair enough: they didn't want to encroach on John's artistic interpretation. They'd already had to regretfully inform him about Dark Horse choosing not to go with his (beautiful) image for the cover, so perhaps they weren't wanting to impose. I can respect that: after all, they're illustrators themselves, and they'd know better than anyone. At the same time, though, I couldn't help but think that an illustrator's job is to illustrate. One of the analogies my tutor at college made was: when a boy is described as wearing a blue jumper in the text, you can do whatever you like - as long as you don't paint the boy in a red jumper. I pondered it over and over in my head, and ultimately, there comes a point where artistic license stops being colourful embellishment one can chalk up to "mental pictures," and just gets distracting. This isn't something like disagreeing about the exact length of Cormac's hair, or his facial features, or whatnot: Watkiss' Cormac simply doesn't fit the Cormac depicted in the text. Watkiss painted Cormac in a red jumper. It's a shame, because do you know who that does look a hell of a lot like (in my mental image)? Someone who's described as "lithe," "rangy," who looks "tall," and certainly not "bulky," "massive," or "gigantic"? Cormac Mac Art. - "Tigers of the Sea"
You know who else? Black Turlogh. He was inches taller than Hollinster who was considerably above medium height. There was no ounce of fat or surplus flesh on that spare frame, yet the man did not look frail or even too thin. On the contrary. His broad shoulders, deep chest and long rangy limbs betokened strength, speed and endurance - bespoke the swordsman as plainly as did the long unadorned rapier at his belt. The man reminded Jack, more than anything else, of one of the great gaunt grey wolves he had seen on the Siberian steppes. - "The Blue Flame of Vengeance"
I don't know what happened here. If this is what Watkiss considers "bulky," then what about those Danes? 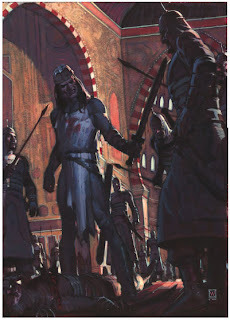 What Watkiss has done is a fantastic picture of Cormac Mac Art or Turlogh O'Brien - or even one of the other "rangy lithe Irish heroes" - clad in 12th Century attire, but it isn't Cormac Fitzgeoffrey. (Come to think of it, his frame actually looks a bit like Jason Momoa). That perhaps what bothers me about this so much - everything else is so good, but Cormac's one of my favourite Howard characters, and... well, Watkiss did him wrong. I can't even be charitable about this: that guy simply isn't Cormac Fitzgeoffrey. And he did everything so damn well, it's indescribably frustrating that the one misstep he made was for one of my very favourite characters. Del Rey haven't been free from such criticisms in the past. Gary Gianni's illustrations for Solomon Kane are mostly fantastic - but he perpetuates the use of the classic Puritan hat when Kane only wore a slouch hat, the front cover is rather more colourful, and the Staff of Solomon is quite a good bit larger than is described in the stories. Mark Schultz perpetuates the damn Greco-Roman Hyborian stereotype in his depictions of Conan's armour in "Black Colossus." I'm one of the dissenting voices when it comes to Greg Manchess's work for The Conquering Sword of Conan, where he picked to depict the Picts as pretty unambiguously Native American, among other things. So this isn't without precedence, but frankly, the good usually far outweighs the bad when it comes to Del Rey's illustrations: so it is the case with Watkiss. Still, I can't be too hard on him. After all, he gave me what I think might be, for me, the definitive visual interpretation of Dark Agnes. And being a Dark Agnes fanboy, I can't think of higher praise than that. EDIT: I found the text I was looking for. Yup, that looks perfect. Bloody great job, Watkiss. I'm with you on the lack of bulk, but what also annoys me about the "aftermath of the final confrontation between Cormac and Nurredin" piece, is the angle the artist chose for the "camera." To me, it makes Cormac Fitzgeoffrey look SHORTER than the dude facing Mister Pointy! Buscema was right--all the information an artist needs is RIGHT THERE in REH's text. You have a point, Tex, but I think it's possible the dude facing Mister Pointy may well have been taller than Cormac. I think it's one of Saladin's retainers, who was "a giant in silvered mail": that might describe his height over his breadth. I just don't understand why Watkiss went with this direction. I'm unsure what story that's depicting (could be Road of Azrael, come to think of it.) I'll need to have a think about it. While I agree with your frustration with the Cormac image I have to say that considering the way Conan and Kull are depicted in the comics medium they are so huge even steroids wouldn't explain their often super heroic bulkiness. So, I guess I'm willing to let this pass because it's refreshing to see a character in the Howard tales depicted as lean and lithe and proportioned like people and not massive earth treading gods. There's a little bias too because I really like John Watkiss work. Normally I'd agree with you Rick, but Cormac is the only one of Howard's Irish characters that really can't be described as "lean" or "lithe". Not necessarily in terms of muscle, but just sheer size: wide shoulders, deep chest, general massive bone structure. Hell, the dude practically looks like a dwarf, his sheer girth making the optical illusion of shortness. As I said, this physique is great for Cormac Mac Art, Turlogh Dubh, Black Vulmea et al, and I'd be perfectly happy with Watkiss' interpretation of the character if they were like that. Frankly I wouldn't even object too much if it was Conan or Kull, who at least have lean waists and whose size is more open to interpretation. I share your disdain for the general style of comics over-emphasizing muscularity - even the normal humans in the Marvel Universe are bigger than Momoa - but Cormac's only been rarely illustrated, and if we're going down the lean & lithe route, I'd rather they went with characters that fit the bill.